EpiPen Manufacturer Offers A Discount, But Critics Aren't Soothed : Shots - Health News EpiPen, the new poster child for prescription drug price gouging, may find that offering discount coupons isn't enough to mollify its critics in Congress and online. 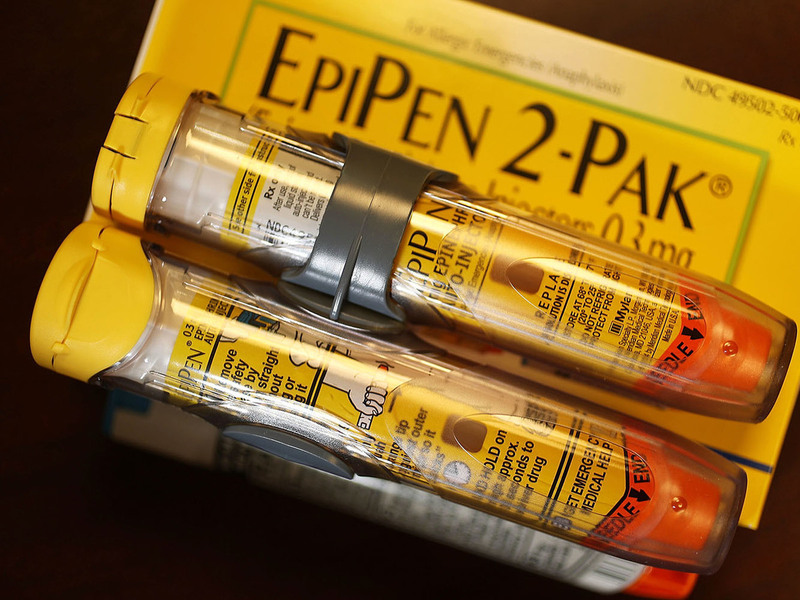 The cost of an EpiPen two-pack has risen more than 400 percent in recent years. The drug is used to halt severe allergic reactions. The move is a reaction to harsh criticism from consumers and several lawmakers over repeated price increases that have boosted the cost of the medication to more than $600 from less than $100 just a few years ago. The company says it will offer the discounts to patients whose insurance doesn't cover the costs because of high deductibles or limited pharmacy benefits. But coupons may not be enough to tamp down anger over the price hikes. "This step is much more a PR fix more than a real remedy," Sen. Richard Blumenthal, D-Conn., said in an interview Thursday. "What's needed is robust, real action to lower the price for everyone, not just a select few." He says the EpiPen has such enormous market share that the company may be violating antitrust laws by exploiting that. A report by the health care website Stat says some of Mylan's contracts to give schools free or discounted EpiPens may have done just that, because they bar the schools from buying competitors' products. Mylan told Stat that the provision restricting school purchasing has since been discontinued, but did not say when it was halted. Blumenthal is just one of several lawmakers who have called for investigations into Mylan's business practices and have asked for justifications of its price increases in recent days. He and a few others say the discounts aren't enough. Blumenthal sent a letter to the company earlier this week demanding that it lower the price. Sen. Charles Grassley, R-Iowa, sent a letter to Mylan demanding an explanation for the increase. And Sen. Amy Klobuchar, D-Minn., has asked the Federal Trade Commission to investigate whether Mylan has violated antitrust laws in its marketing of the EpiPen. Rep. Elijah Cummings, D-Md., says his Oversight and Government Reform Committee would hold hearings. "Offering a meager discount only after widespread bipartisan criticism is exactly the same tactic used by drug companies across the industry to distract from their exorbitant price increases," Cummings said in a statement. And Democratic presidential hopeful Hillary Clinton weighed in on her Facebook page. "It's wrong when drug companies put profits ahead of patients, raising prices without justifying the value behind them," she wrote. The wholesale price of a single pen was about $47 in 2007. It rose to $284 this summer, according to Richard Evans, a health care analyst at SSR. But consumers can no longer buy a single pen, so the retail price to fill a prescription today at Walgreens is about $633, according to GoodRX. Blumenthal says a solution could require new laws. "At the end of the day there may need to be stronger legal protections against these types of price gouging and profiteering at the expense of people who need a lifesaving drug where the company has a stranglehold on the market," he says.